Coffee machine and water dispenser were the highlights of this hotel. Also loved the close distance to everything. Good rates and excellent location. Room was nice and Happy Hour was a nice touch. This hotel is right off of the river downtown, but it is in need of renovations. The temperature in each room can not be controlled. I asked them to turn the temperature down because it was too hot, and they advised me to just turn the fan off in the room since the heater was on. I’ve stayed in a lot of downtown Chicago hotels, and this is by far my least favorite. The room was very clean. View was great and staff was excellent. Bed seemed smaller than a queen. Was woken up both mornings by sound of water running down from upper levels. Great location for everything! The snack and coffee service were great - a nice benefit. We also enjoyed free wine and cheese one night by their fireplace, which was a lovely surprise. We didn’t use it, but the gym looked great! It’s was as expected.There was a clean room clean sheets friendly staff. In addition there is a coffee machine which was nice. Great service. Front desk staff was exceedingly helpful. Thank you Seth for the hospitality and recommendations. Great experience, friendly and helpful staff members. Close to all kinds of things. Great place. Friendly, helpful. 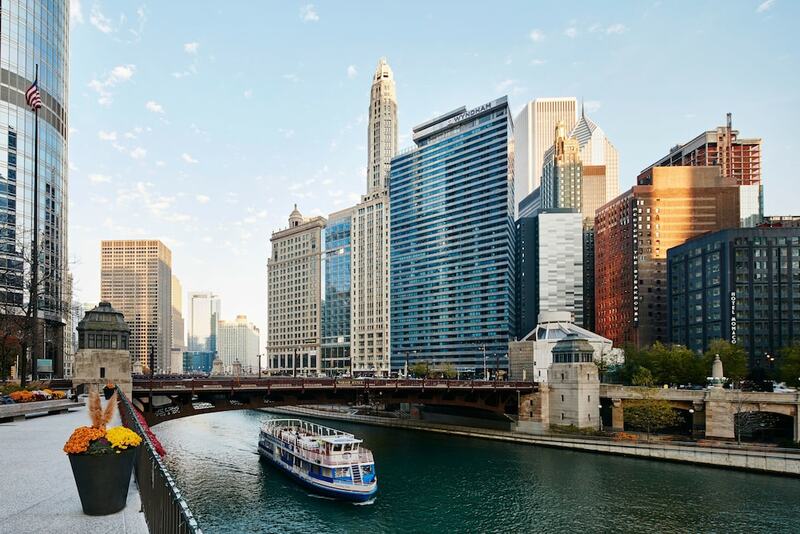 Located in The Loop, River Hotel is adjacent to Chicago Riverwalk and within a 5-minute walk of other popular sights like Chicago Theatre. This 121-room, 4-star hotel welcomes guests with a restaurant, free in-room WiFi, and a fitness center. Order from room service to satisfy your hunger without leaving your room, or enjoy a bite to eat at the onsite restaurant. A flat-screen TV comes with satellite channels, and guests can stay connected with free WiFi. Beds sport premium bedding and the bathroom offers a hair dryer and free toiletries. Other standard amenities include an iPod dock, a coffee maker, and free bottled water. Guests of River Hotel enjoy a fitness center, free WiFi in public areas, and conference space. Valet parking is available for USD 53 per night. The 24-hour front desk has staff standing by to help with dry cleaning/laundry, concierge services, and securing valuables. Additional amenities include a business center, express check-in, and express check-out. Thank you for staying with us Megan. We appreciate your feedback. I apologize that we did not meet your expectations this visit. I hope you will give us another try in the future. Thank you for staying with us. We appreciate feedback and kind words about the staff. Recreation features at River Hotel include a fitness center.